Canvas Skateboards is a company that hand crafts 100% USA durable, top quality skate decks and long boards in San Diego, CA. They launched a new website for customers where you can personalize a custom skate board by choosing original artwork and graphics, or get one done up by an artist/designer. They are also assembling a talented family of artists and designers to belong to their global artist community and invited me to have my own Artist Gallery on their site! Canvas Skateboards use digital printing on their boards, which ends up very close to the files I submitted. The printing is embedded into the a special coating that makes the design last longer than other methods applied to boards. Their boards are very durable in construction and printing. After speaking to their CEO Randy, I can see how professional and dedicated he is to creating a beautiful and awesome product, and I did not hesitate to join his community. 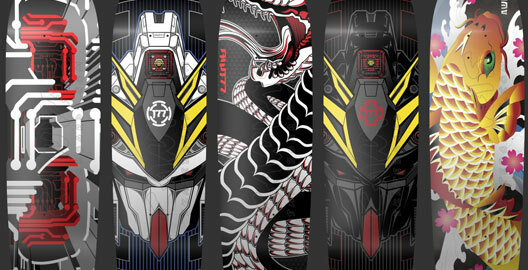 I created 5 decks with my designs, all are 9″W x 32.375″L – 15″ Wheel Base. Directional shape, medium concave with kick nose and tail. Designed for ripping up pools, parks, streets or just cruising with friends! All decks come with grip tape and start at $65.